At the post-match interview, I made a comment that our current trend of winning everything in sight is bad news for the Premier League. We have been dominating the domestic front for the past 3 seasons and only Chelsea came closest to upsetting us in my first season in charge. But after that, no team had managed to do so and it became worst this season. Right now, we held a 21-point lead at the top of the table and it seems that this would increase in the weeks to come as the 5 teams immediately below us were up against each other for the next couple of matches. Teams that were supposed to challenge us this season has faltered along the way, we weren't playing any better too as we have nearly the same squad as the previous season. It seems that the other teams have a trouble with inconsistency whereas Arsenal managed to play well week in and week out. We were not unbeatable and that was shown clearly when we lost to Aston Villa and Middlesbrough. Most of the teams we faced usually aim for a point, which is why they play defensively allowing us, space to move. Once they find themselves a goal down, their defense start to crumble and we scored more. Hopefully, we will see a change in this pattern next season. After conquering the domestic league, we were up against Leverkusen in the Champions League Semi Final match. Surprisingly, all 3 Italian teams lost in the Quarterfinals. A 3-0 win at Highbury and we were looking at the Final in Rome. I rested a few players in the return leg and that allowed Leverkusen back into the game but it was too little too late for them. We drew 2-2 and had a date with Barcelona in the Finals. We finished our season with easy wins over West Ham (1-0), Liverpool (2-0) and Ipswich (3-1). As predicted, the other teams were caught up with battles against each other, giving us the biggest winning margin ever in the League - 27 points. What was even more surprising, Tottenham Hotspurs were relegated and teams like Leeds and Liverpool finished at the bottom half of the table. All in all, the top 5 league standings at the end of the 2002/03 season: Arsenal (94), Chelsea (67), West Ham (66), Manchester City (65) and Manchester United (64). The European Cup Final was to be held at the Olympic Stadium in Rome. Previous records showed that both teams had met each other 4 times in the last 3 seasons, with both teams managing a win each and 2 draws. Both sides were out to prove the critics wrong. On paper, Barcelona have a better squad, with top scorer Kluivert, Petit, Montero, Davids and Ortega. We have seen what they can do to our defense when we were held to a 1-1 draw at home and a 2-2 draw away, earlier in the Phase 2 group matches. 83,000 fans from both sides were in Rome to watch the match. Red and blue filled one half of the stadium whereas red and white filled the other. Fans from both sides were chanting and cheering their team on. Both sides started defensively, with play moving from one end to the other. On the half-hour, Pires chipped the ball towards Henry. Henry wandered off into the left side of the field before laying the ball back for the in-coming Bergkamp. GOAL! We've taken the lead. Barcelona pushed forward in numbers. 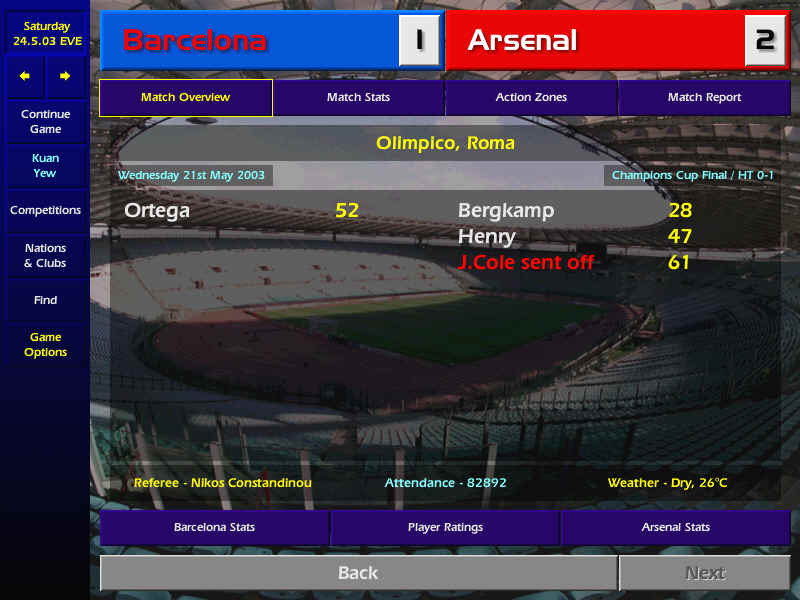 At the start of the second half, I brought on Ljungberg and Lauren to replace Pires and Parlour. Ljungberg immediately made his mark when he intercepted a pass before sending it to Henry. Henry swiveled and took a shot. GOAL! 5 minutes later, Ortega kept Barcelona in the game when he scored with a ferocious left-footed strike. The Barcelona forwards kept us under constant pressure. To make matters worst, Joe Cole got himself sent off and we had to play the remaining half an hour with 10 men. Manninger started to show what he could really do between the sticks after several disappointing games in goal. His heroic antics lasted for 90 minutes and when the final whistle was blown, I rushed out to hug him. We have won the European Cup for the third consecutive time. [ScreenShot] This put us in the same category as Real Madrid, Bayern Munich and Ajax Amsterdam, who have won it 3 times in a row. What made it sweeter was that Southampton won 3-0 against AS Roma in the UEFA Cup. Our European record this season after 17 tough matches was 12 wins and 5 draws. We scored 39 goals while conceeding 12.